Story by Ashley Kulp, Metroland Media (Smiths Falls Record News). Used with permission. Lanark County youth will benefit from the value of restorative justice with a new three-year outreach initiative, courtesy of the Lanark County Community Justice Program (LCCJP). 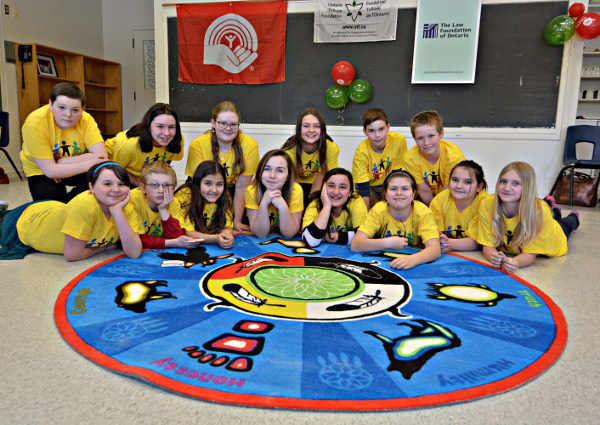 The Promising Young People program, which will bring the restorative approach into schools and youth centres, was officially launched during a special ceremony at St. Francis de Sales Catholic School in Smiths Falls Feb. 26. Local dignitaries, including Smiths Falls Mayor Shawn Pankow, Lanark County warden Gail Code and Lanark-Frontenac-Lennox and Addington MPP Randy Hillier, as well as policing, mental health and school board partners, gathered to hear about the initiative, made possible through a $318,000 Grow grant from the Ontario Trillium Foundation. Other partners offering financial support include United Way Lanark County, who threw in $20,000 over the next two years through a United Way Collective Impact Grant, and $15,000 from The Law Foundation of Ontario. Fittingly, the event was the first gathering to be held in the school’s new peace room, featuring an Aboriginal theme, complete with vibrant murals. Guests received warm welcomes into the school by groups of students wearing bright yellow T-shirts, created for the program launch. The concept for the room was put into gear thanks to principal Theresa Lalonde-Pankow. She had hoped to have the room ready for student use by May, but when Smiths Falls Police Const. David Murphy volunteered St. Francis as a possible venue for the Promising Young People launch, that timeline sped up. Lalonde-Pankow said it’s important to teach students at a young age to go to people they’re having difficulties with to solve problems. “We’re hoping we’ll be able to do that from this room,” she commented. Commenting there are “always two sides to every story,” Peterkin said going to court and sitting in front of a judge doesn’t necessarily provide the opportunity to tell that story. That same approach that has had so much success for LCCJP will now be applied in schools and on playgrounds, encouraging students to work out their conflicts and respect one another. Following the presentation of an Ontario Trillium Foundation plaque, LCCJP board member Scott Ferguson read a statement provided by The Law Foundation of Ontario, who were unable to have a representative in attendance. “The Law Foundation of Ontario is proud to be a contributing funder to this exciting project. Projects such as this align with our foundation’s vision statement: Putting people at the front of justice,” the statement read. “In addition to acting as a diversion method away from the courts and facilitating greater access to justice, restorative justice practices can be an effective way to avoid conflict, build self-esteem and communication skills in our youth and improve the overall health of the community. United Way Lanark County’s board president Helen McIntosh said the organization has been partnering with LCCJP since 2007 and believes in the work they do. “…We’re pleased to see the way the Lanark County Community Justice Program’s community programs work with our partners to bring important community projects as it is an excellent example of United Way Lanark County’s desire to encourage organizations to work together for a greater impact,” she remarked. “This project holds great potential and we look forward to seeing the outcomes and seeing the many ways in which we know the county will benefit. While it’s easy to blame youth who make bad judgments or follow the wrong path, Code said it’s not always their fault. A St. Francis alumnus himself, Pankow said sometimes youth don’t make the best decisions and end up in the court system, but LCCJP can stop that before it happens. Prior to cutting the ribbon to officially launch the Promising Young People program, LCCJP board member Murray Long thanked Peterkin for her tireless efforts in securing funding. For more information on the Lanark County Community Justice Program, visit www.commjustice.org.